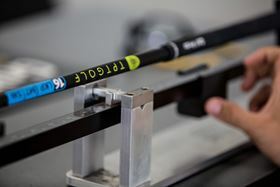 The automated tube manufacturing process can produce concentric carbon golf shafts which were recently launched under the brand name TPT Golf. North Thin Ply Technology (NTPT) plan to launch new materials for the autosport market at JEC World 2017, taking place in Paris in March. The company will also showcase its range of Thin Ply Prepregs, processing technologies and products for performance sports, along with a new, fully automated manufacturing process for tubular structures. Launching this year at JEC World, ThinPreg TP135 is an epoxy prepreg system delivering a set of composite properties that NTPT says was previously unavailable in ultra-low fiber weight prepreg materials (30gsm upwards). Developed in collaboration with the École Polytechnique Fédérale de Lausanne, TP135 has improved compression after impact (around 300MPa on a quasi-isotropic intermediate modulus laminate) and strength properties (1st ply failure at >900MPa for UD ThinPreg TP135 QI laminates with IM fiber). It is suitable for highly loaded applications such as aerospace, F1 and other autosport structural parts. NTPT will also showcase its new composite tube manufacturing process which makes symmetrically stiff tubes which can be developed to meet different design requirements. A focus of the process development was to keep costs low so re-shoring composite manufacture to Europe and the US is now a real option for customers. The process is suitable for any tubular structure where weight, performance and cost are important factors, and include applications such as automotive drive shafts, windsurf masts and golf shafts. Sigmatex plans to showcase its complete range of carbon fiber textiles at JEC World 2018, taking place from 6–8 March in Paris.